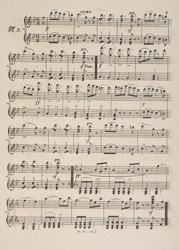 T. Packer designed this beautiful music sheet illustration. He was for a time one of the leading designers and specialised in depicting sheet music with landscape titles. His skies are particularly characteristic because of the striking way in which he drew clouds and reflections in water. The invention in 1837 of chromolithography, using stones as printing blocks, made it possible to produce coloured pictures inexpensively and in large quantities. Some cover illustrations were still printed in black and white and this was so that the purchaser could colour them in by hand, this was a popular past time and many examples can still be found today.